This Fender Squier Jagmaster is a marriage of the Jazzmaster and the Jaguar models. The customer wanted two new pickups installed, switching designed and wired, and a setup performed. 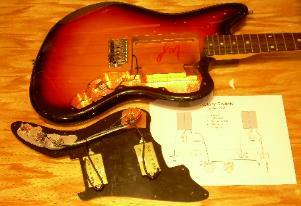 After initial measurements, the guitar came apart. There was no shielding in the control cavity, so step 1 was to copper-shield this hum-producing area. During this process an anti-shock capacitor was added to reduce the chance of dangerous cross-grounding shock. Next a wiring diagram was developed to allow 5-way switching and coil tapping: 1: Neck Pickup 2: Both Parallel 3: Both Parallel, out of phase 4: Both Series 5: Bridge Pickup...where either humbucker can be made single coil by pulling up either the volume or tone controls. At the customer's request, the jack was replaced by a Switchcraft jack, and the switches were wired and tested. After reassembly, the guitar was strung and thoroughly set up (nut and bridge action, relief, pickup height, tremolo adjustment screws all checked, intonation adjusted) and polished.